As experts in garage doors, we’ve put together this brief guide to help you understand the different types. Garage doors can make up to 20% of the overall façade of your home, so it’s important they look good, as well as function properly. We’ve overseen thousands of garage door repairs in Perth over the years and can tell you that there are four basic types of doors: swing out, swing up, roll up, or slide to the side. The most popular choice is usually a sectional roll-up door because they are the most compact and functional. However, if you need to keep the ceiling clear, then swing-out doors or sliding doors are a good choice. 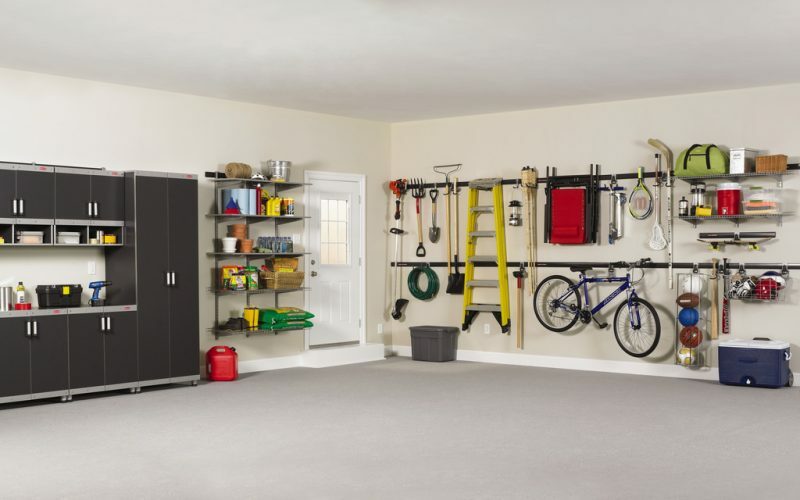 If you prefer a basic garage door and have space, then you can go for a swing-up door. There may be space constraints that determine the style of the garage door you choose, but it’s also important to pick a door that suits the style of your home. For example, a modern roll-up door may look out of place on an older property, where a more traditional style of swing door may fit in better. However, you needn’t allow the look of your home affect which style of garage door you have in place because there are many features that will determine how your garage door looks, such as panels, trim, and other detailing. You can change the way your garage door looks without needing to change the way it opens. 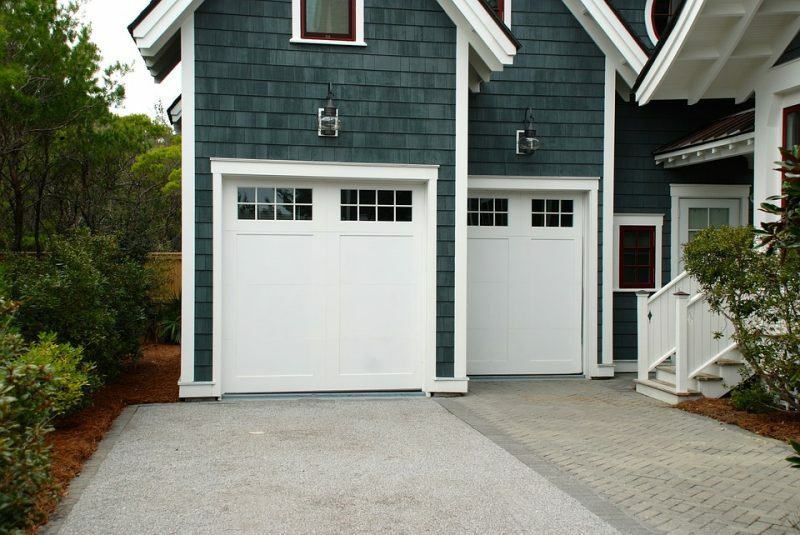 The traditional material to use for a garage door is wood, and it is still popular because of the way it looks. Wood doors may be visually appealing, but they require frequent repainting or refinishing, and are susceptible to rot, particularly in damp climates. Steel doors require much less maintenance. It is an inexpensive but very tough material, but if left exposed steel will rust. This means any scratches to the paintwork have to be dealt with immediately and is one reason why some people choose a steel door with a fibreglass overlay, which resists dents and doesn’t rust. Aluminium has long been a material of choice for garage doors, especially if they are the sturdy versions with heavy-duty frames and dent resistant laminated panels. Although these can get expensive, many people feel it’s worth the investment over time. If you want to spend less, then consider a door with an aluminium frame but panels made of other materials, such as high-density polyethylene, which is light and strong, and much more cost-effective. If you’re interested in having your garage door repaired or replaced, then please call now on 04 3800 2603. Greg at Fix-a-Door will be able to provide you with a free quote whether you want a wooden, steel, or aluminium door, in any style. You can also contact us through our website, using the form on the ‘contact us’ tab and Greg will get back to you. Just leave your name, email address, and phone number, and let us know when is most convenient to give you a call. There are a number of problems with garage doors that we encounter on a regular basis through our work in Perth and the surrounding area, some of which only affect automatic doors and some of which may afflict manually operated doors as well. The good news is, such problems are rarely fatal and can normally be repaired in a matter of hours, either by yourself or by one of our experienced technicians. Below, we have listed 4 of the most common issues encountered by local residents, along with some tips on what to do if you should encounter these problems in your home. If you should happen to experience any of the problems in the following list, you may either attempt the suggested fixes yourself (for those problems that are easily fixed without calling a technician) or simply get in touch with us and we will be happy to send one of our garage door engineers in Perth to your home. 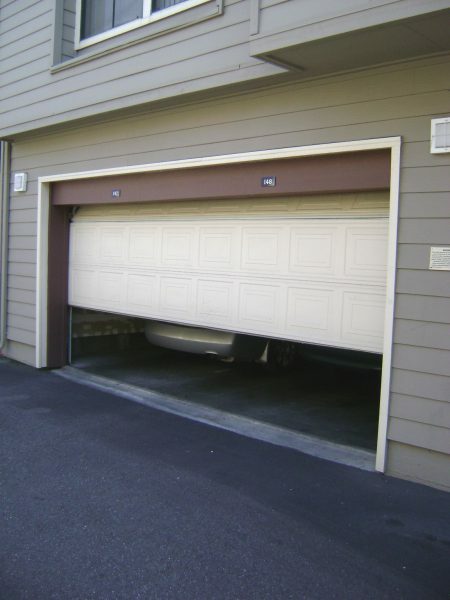 Your Door Opens or Closes with a Bang – If you can hear a banging or thudding noise as your garage door opens or closes, the root of the problem is probably a broken torsion spring. Another common issue that causes the same symptoms is a broken lifting cable. In both cases, asking your local garage doors repair specialist in Perth to replace the broken component is the recommended solution. Your Automatic Door Fails to Open or Close Intermittently – If your garage door sometimes fails to open or close, there are a couple of common reasons behind such a fault that it is worth exploring before calling a technician for help. Firstly, the battery in your remote control may be coming to the end of its useful life. If this is the case, replacing the battery should restore your garage door to normal working order immediately. The second possibility, which is far less likely, is that your neighbour has an automatic door with the same remote control and it is interfering with yours. This only occurs with older garage doors and can be fixed by upgrading the remote control system. Your Automatic Garage Door Starts to Close Then Opens Fully Again – In the event that your door should start to close then go back up again, the most likely reason for this behaviour is poorly aligned photoelectric sensor units. Our garage door service in Perth covers the realignment of such sensors so please feel free to call and ask for help if you are unable to align them yourself. The Motor Runs But Nothing Happens – Another common issue that happens with some automatic doors and one that is usually due to the disconnect switch having been enabled. To resolve the problem, simply disable the switch. If you are experiencing any type of problem with your door and you would like some help, please do not hesitate to call at any time. We specialize in garage door repairs in Perth and will be delighted to be of service. Your garage door is normally the largest moving part in your home and, as such, needs a regular Garage Door Service to meet the terms of your warranty, prolong its life and ensure it continues to operate safely. Check and retention springs, if necessary. Check and adjust safety reverse system on automatic openers. Check and adjust open and close limits on automatic openers. Test to ensure safe and smooth operation. with the Remote to the Garage Door. Sally also got her door locks replaced that morning. With Fix A Doors quick response we were able to relieve Sally’s fear of the intruder returning.